Do you have a shipment that cannot be transported under ‘regular’ circumstances, due to size, weight or a particular way of securing the cargo? Not a problem for Aircargo Transport! 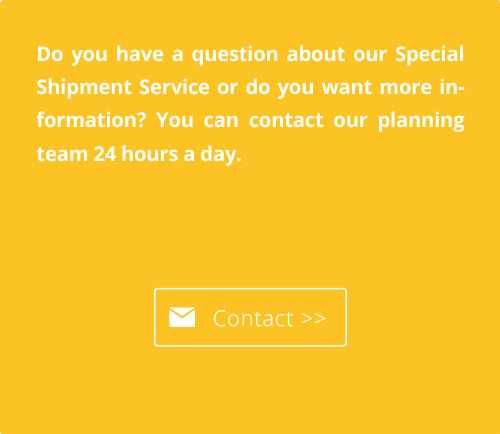 Even better: we have extensive experience with special shipments! From aircraft engines to helicopter blades, cars and machinery of extreme size; no cargo is too much for us! So rest assured that your cargo is in good hands. Our qualified drivers have the experience and know-how to deal with special shipments. In short: they know better than anyone how best to secure and transport your cargo. Not only do we have drivers with the right knowledge, we also have the right equipment to handle special shipments: trailers with sliding or retractable roofs of up to twenty centimetres, or curtainsiders. The possibilities are endless.